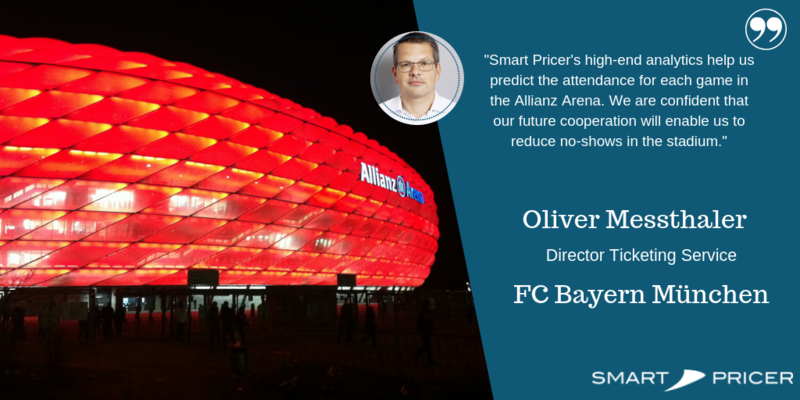 We at Smart Pricer are proud to be working together with one of the most successful football clubs in the world, FC Bayern München by reducing the club’s no-show rate. Our data scientists have considered factors such as weather, day of the week, opponents, and more to build an algorithm that predicts unused tickets per game and ensures timely resales. The project is run together with Horstmann Strategie & Management Consulting, Our machine learning-based prediction and steering algorithm optimize the load factor of stadiums and venues. As a result, revenue increase is achieved by overbooking the venue or stadium using our no-show predictor. Furthermore, we review and optimize the current system of season cards and second markets. We’re creating an unforgettable experience for fans in the Allianz Arena with promising No -Show predictions. As a result, fans visit a well-filled stadium each game, creating an atmosphere that sets football apart. FC Baern München’s no-show rate can be reduced successfully. FC Bayern is a German sports club based in Munich, Bavaria. Its professional football team is part of the Bundesliga since 1965-66. The club is the most successful club in German football history. After all, they won a record 28 national titles and 18 national cups. The Allianz Arena is the major football stadium in Munich, with a 75,000 seating capacity. The stadium is the second-largest arena in Germany behind the Westfalenstadion in Dortmund. FC Bayern Munich has played its home games in the Allianz Arena since the start of the 2005–06 season. Furthermore, the Allianz Arena will be one of the playing venues of the Euro 2020 tournament, hosting three group matches and one quarter-final. Smart Pricer provides cinemas, sports clubs, entertainment venues and ski resorts around the globe with the necessary tools to increase ticketing revenues. We have over 10 years of airline pricing experience and done millions of pricing optimizations. Smart Pricer is the go-to-partner for many venues such as Europe’s largest cinema chain, UCI, Berlin’s Bundesliga club, Hertha BSC and Ski resort Zermatt. We continues to help companies achieve an increase in ticketing revenues by +5-15% while enhancing visitor satisfaction. Please head over to our sports page to discover all solutions we provide in this industry. Contact us to discuss how our apporach on the Fc Bayern München no-show rate can be used for your stadium.